How Do I Print a Quiz From Blackboard 9.1? 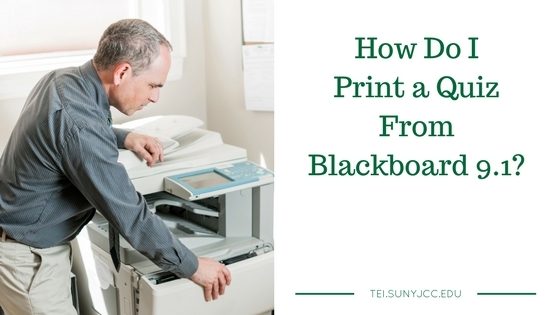 Yesterday, a SUNY JCC faculty member asked me how to print a quiz from Blackboard. I thought the answer was pretty easy; however, after doing some research, I discovered the feature was not available in Blackboard 9.1. So, taking the advice from many others, I put together my own solution. It will require copy, pasting, and Microsoft Word macros. In order to print out a relatively clean version of the quiz, I had to copy it from a student view of the Blackboard quiz and paste it as unformatted text into Microsoft Word. I then cleaned up the text using a macro I created for Word. Note: These procedures were developed using a PC computer and Google Chrome. Switch to student preview mode by click on the “eye” icon towards the upper right portion of the screen. Highlight the quiz by placing the cursor at the beginning of the quiz name and select the entire quiz until the end of the last answer. Right-click on the selected text and click on copy. Open Microsoft Word and click on the empty document. Using the paste drop-down menu from the toolbar, select the Keep Text Only option. Clean up the document as you desire or run the macro described below. If you are repeating a process over and over, you may want to let technology take over. In this case, if I was going to regularly copy my quizzes in Blackboard, paste them in MS Word, and clean them up, I would certainly want to produce a macro to do this job for me. I have created a macro to clean up quizzes that I have pasted from MS Word. To save you the effort of recreating this macro, I will simply share it with you. I call it CleanBbTestMacro. Important: You will need to save the file to your computer and change the extension from .txt to .bas. Select the Customize Quick Access Toolbar drop-down menu at the top of the screen. Click on More Commands link. Select Customize Ribbon menu option. Within the right-hand list of menus, check the Developer check box. Click OK. A dialog box should automatically close. Click on the Developer menu tab. Click on the Visual Basic button. Right click on ThisDocument and select Import File option. Locate your file ending in .bas and click on the Open button. Click on File menu option and select Save Normal option. Click on Macros button and verify that CleanTest macro is in the list. Close the dialog box. Add macro to the toolbar. From the Choose commands from the drop-down menu in the center of screen, select macros option. Select macro from the list and click Add >> button. Select modify button if you wish to change the look of the macro button. Remove Developer tools if so desired. If you have any questions about these procedures, please drop me a note. How Do You Create an Ungraded Practice Test in Blackboard?